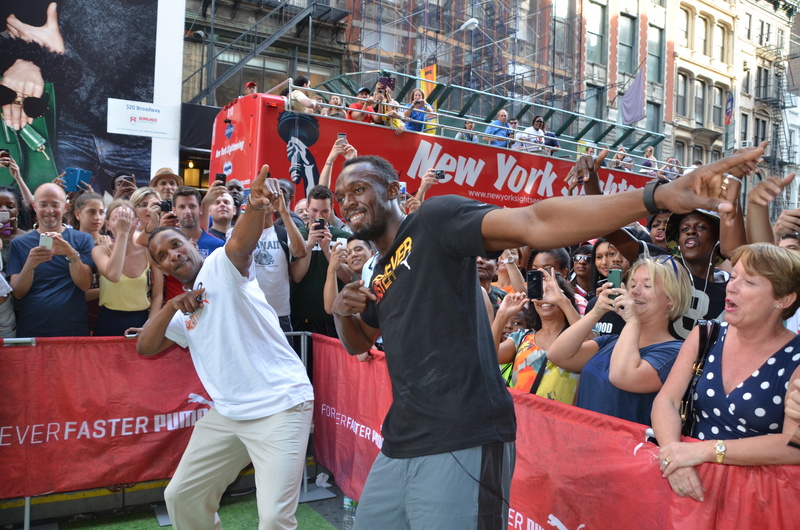 NEW YORK CITY (March 25, 2015) — Usain Bolt will compete in New York City for the first time since 2008 when he returns to the adidas Grand Prix on June 13, organizers announced today. It will be a homecoming of sorts for Bolt, who set his first World Record in winning the 100 meters in 9.72 seconds at Icahn Stadium on May 31, 2008. His 100-meter World Record now stands at 9.58 seconds, while his 200-meter mark is 19.19. Bolt has competed in the United States only once since that night, when he anchored a Jamaican 4×100-meter team at the 2010 Penn Relays. Tickets for the Diamond League event, which is marking its 11th year of bringing the world’s top athletes to New York City, are on sale now at www.adidasgrandprix.com or by calling 1-877-849-8722. Since that electric night at Icahn Stadium seven years ago, the 28-year-old Jamaican has won six Olympic gold medals and eight World Championships titles, broken seven more world records, and become one of the most famous people on the planet. Already the first man to win six Olympic gold medals in sprinting (at 100 meters, 200 meters, and the 4×100-meter relay in both 2008 and 2012), Bolt hopes to add to that legacy at the 2016 Olympic Games in Rio de Janeiro. He recently announced his plans to retire after the 2017 IAAF World Championships in London. One of the premier track-and-field events in the world, the adidas Grand Prix has hosted two World Records and 17 National Records in its first 10 years, and its fans have had the privilege of witnessing more than a dozen performances that were the fastest ever recorded on U.S. soil. Bolt’s 2008 performance qualifies in all three categories. The seventh stop on the international IAAF Diamond League circuit, the adidas Grand Prix is in its 11th year at Icahn Stadium on Randall’s Island, in conjunction with the Randall’s Island Sports Alliance. The latest news, photos and information on the event can be found at www.adidasgrandprix.com and here on Facebook and Twitter, @adidasgrandprix, #AGPNYC.